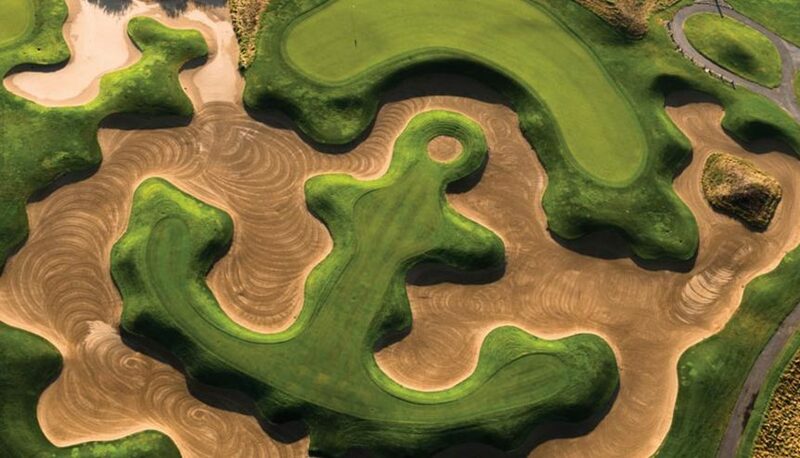 Golf course bunkers come in all shapes and sizes, but some of those shapes and sizes are a bit more clever and symbolic. This month, GCM spotlights some of the more distinct and, in some cases, colorful bunkers we’ve come across. This bunker forms the leaf on the 17th-hole island green, with players accessing the green via the fruit’s “stem” walkway. The Snoopy bunker on Highland National Golf Course’s 15th hole is an homage to “Peanuts” creator Charles M. Schulz, who learned how to play golf at the course in St. Paul, Minn., in the 1930s. Kansas State University’s wildcat mascot has left its mark on the fifth hole of Colbert Hills Golf Course in Manhattan, Kan. Even the bunker’s sand sports school spirit, imbued with KSU’s signature purple. Pincers primed, “Old Crabby” the Dungeness crab guards the third hole at The Cedars at Dungeness in Sequim, Wash. A filling of red volcanic cinders from Bend, Ore., enhances the resident crustacean’s realistic look.